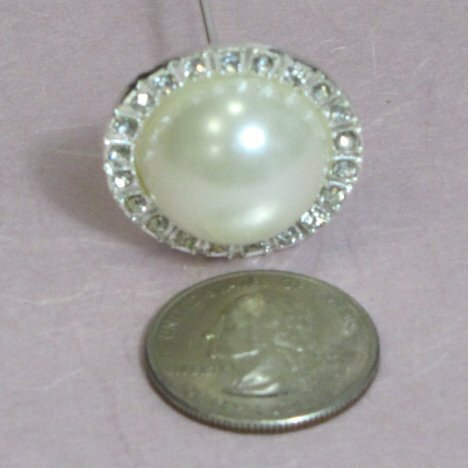 This brooch is a large circular pearl surrounded by a ring of rhinestones. 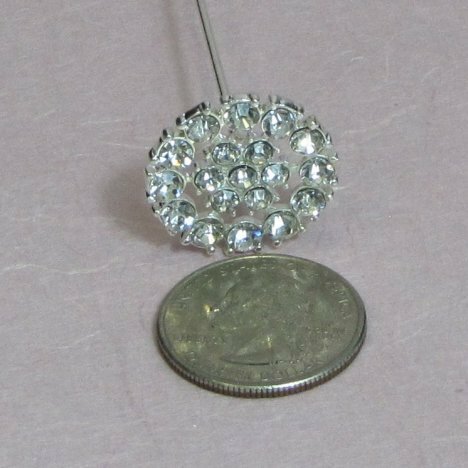 Dainty and compact, this circular brooch is encrusted with sparkling rhinestones. 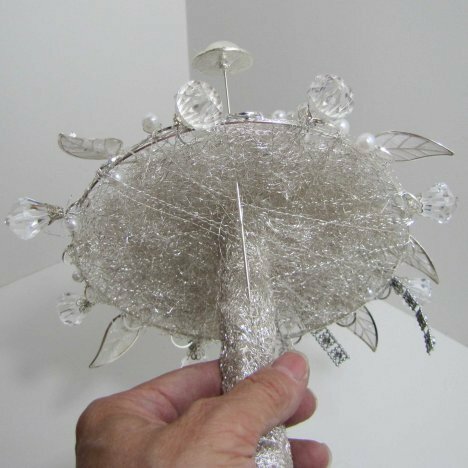 Insert the brooch into the bouquet at a slight angle from the outside, making sure it pierces through the angel hair wire and into the foam on the inner portion of the handle. You can place some small strips of Uglu on the underside of the brooch if you wish to ensure that it doesn't move. 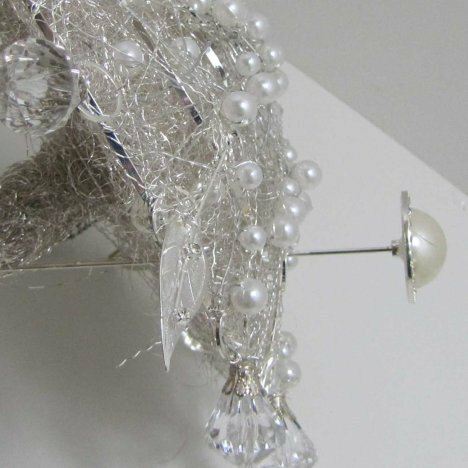 You can see from a side angle how the brooch's pin is placed deep into the handle. Make sure no sharp points are outside the handle where they can injure someone's hand. 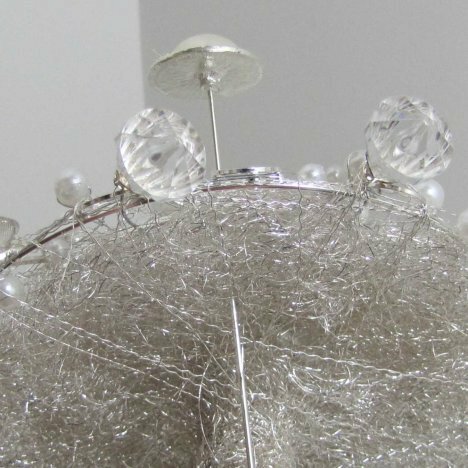 You do have the option of cutting the brooch pin very short and inserting just into the angel hair wire and securing with Uglu on the underside of the brooch. I like inserting them into the handle, however, because it seems more secure that way. 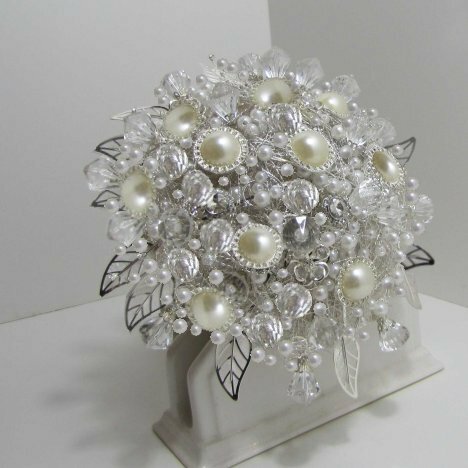 Placement of each brooch into your crystal bouquet should look scattered - yet evenly distributed. I suggest that you insert all one style first, then the second style and so forth. 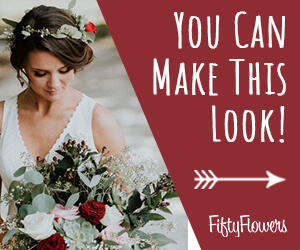 If you have a very special, unique brooch, place at the top of the bouquet for more visibility and impact. 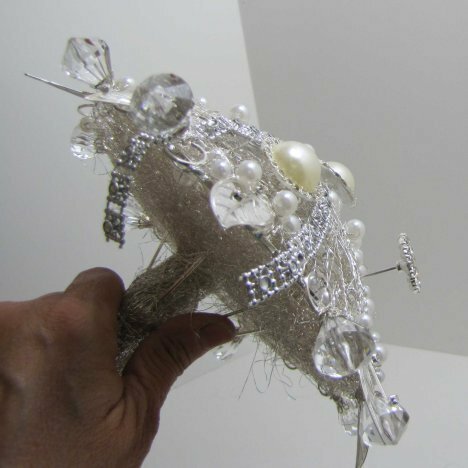 Be careful when inserting the long stemmed brooches that you guide them gently into the bouquet handle, piercing the inner foam so that no pointed edges are exposed. 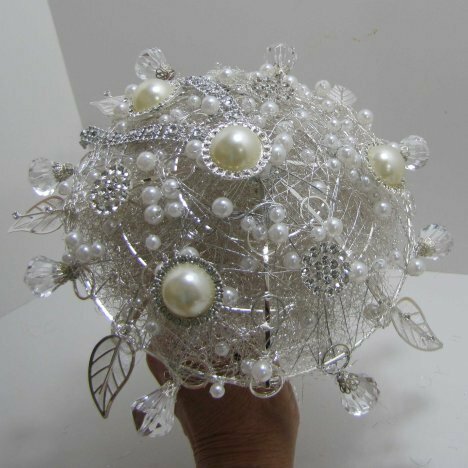 The bouquet is now really beginning to take on a stylish personality and has a beautiful, customized look. It's really up to you as to when you are finished. 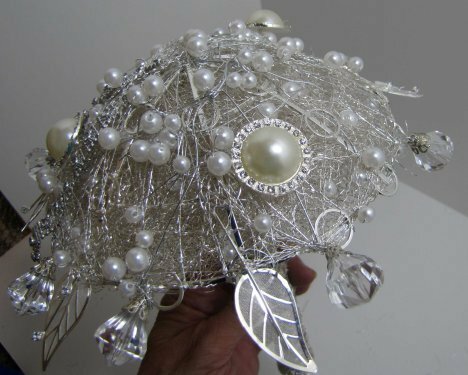 After placing some more of the large pearl brooches and the metal leaves, I wound some more beaded pearls in among and around the elements of the design. 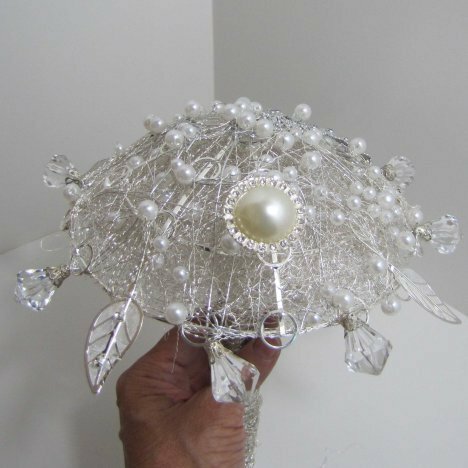 Some brides like to add touches of colored brooches, while others prefer the satin roses. 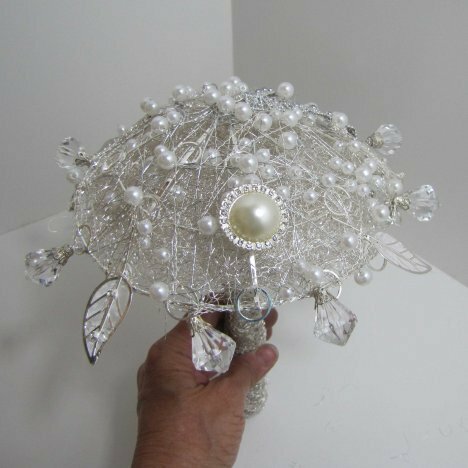 The bouquet armature is what is the best part, as it keeps the bouquet size down and the framework is much lighter than giving a wire stem to every brooch. That method can begin to weigh quite a bit more than anticipated than when using the armature.